The following information gives perspective to the 'troubles' that plague the Middle East. This study narrative is based on geomancy. Geomancy is a subtle science identifying geographic patterns. One such pattern is a ley line, the coherence of nature and culture in a straight line across a yard, city, region, or planet. The two leys discussed in this article cross in Amman: one Arabic (for lack of a better term) and the other European (for lack of a better term),. Amman, Jordan, in Roman times, was known as Philadelphia. Like the Philadelphia, Pennsylvania of old America, an ocean away, Philadelphia, Jordan of today is a keystone of religious tolerance, brotherly love and constitutional justice. The intent of this article is to show just how important Amman is to the world and to peace to in the Middle East. What are these ley lines of the Middle East ? Each war, each conflict, each death sets a memory into the earth. Histories of violence coalesce, spilling into ley lines of violence - wounds aggravated by disposition. After all these centuries, millenniums of war, a deep pattern is embedded in the planet. Examining the chaotic patterns of conflict a coherence emergesÐ a focus or road of war leading to the Middle East. Some years ago a colleague introduced me to a trans-global alignment of cities. At the time it was interpreted as a spine of culture. This European alignment, or cultural coalescence, courses through Mexico City, Atlanta GA, Washington DC, Baltimore MD, Philadelphia PA, Trenton NJ, NYC, New Haven, Boston MA, through Nova Scotia, Newfoundland, Dublin, London, Belgium, the Franco-German border, Kosova, Haifa Israel and Janin on the West Bank- Amman Jordan and into Saudi Arabia. Over the past 600 years, this ley line has been entrained with European adventures from the conquest of Mexico by the Spanish Empire, to the assassination of Archduke Ferdinand, the Croatian War, the Bosnian War, the Kosova War, Waterloo, the Battle of the Bulge, the Irish War of Independence, The Bombing of London, the American Revolutionary and Civil Wars, the War of 1812, WTC 9-11, with world wars, revolutions and riots interspersed. The two anchor regions of this trans global ley are Mexico and the Middle East,. In the past ,human sacrifice was practiced in both these locations. Could this wave form, this abomination, still animate this line? The Aztec Priests surely cursed the Europeans as their only recourse against the steel of the Spanish. The Aztecs in this way were avenged at the hands of the English in the Irish Sea - in the destruction of the Spanish Armada. At the other end of this line, lies Israel. It is historically known that the Pharonic Priests cursed the rulers, peoples, and lands of Cananite, Ashkelon (Israel), worshipers of the monotheistic deity El and practitioners of human sacrifice. The Egyptian Priests and Pharaoh perceived this as outside of The Ma'at, the order of the universe. Whether or not one believes in curses, it seems prudent to keep this history in mind. Human sacrifice still exists today by the acts of suicide bombers. Another ley marks important Arabic cities. This ley courses out of northern Africa along the southern border of Algeria. This ley of Arab culture marks the Nile Delta at Tanta Egypt, passes through cursed Asheklon, then to Jerusalem, Amman Jordan, Baghdad Iraq, Kabul Afghanistan, the Line of Control across Kashmir and onto China and Taiwan. The city of peace at the cross roads of these primary European and Arabian leys is Amman JordanÐ The Philadelphia of Arabia. In a geomantic sense, cross cultural conflicts can be arbitrated in Amman. Differences can be overcome. Common ground can be planted. Through Amman the call to prayer can be heard in the West and the call to freedom heard in the East. A convergence exists in Amman. It is the place where healing begins and forgiveness found. Forgiveness is a force stronger than gravity. Amman Jordan, the crossroads- the hub- is auspiciously placed to facilitate peace and reconciliation. Diverse spiritual leaders, prophets, scientists, and politicians proclaim that we are at 'the Crossroads'. We can continue down this path of destruction or take a turn towards an inclusive sustainable future. 19th century sandstone panel, probably from Agra. The angle these two ley alignments converge on Amman is 60 degrees. Dividing a circle by 60, generates a hexagon (six sided form). Hexagons nest like no other geometry. A hexagon is the symbolic geometry known for connecting the worlds. Harmonious community is well exampled by the hexagonal geometry of bee hives. 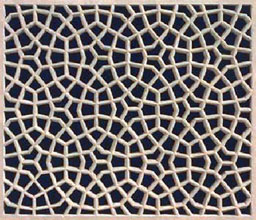 Of note here is the hexagonal lattice found in Arabic structures known to reduce the temperature of the passing winds. The hexagon cools the fires of war and the desert winds with the geometry of snow.